BUCYRUS — As workers clear the rubble from the demolition of the farmhouse that was once home to Posey’s restaurant on Hopley Avenue in Bucyrus, Gavin Gould recalled the childhood he spent there. “My grandparents, Bob and Mary, opened the restaurant in 1947, after World War II,” he said. Gould grew up in the restaurant, first helping his grandparents and then his mother. “My mom Stephanie took over the restaurant in the late 1980s when my grandpa got sick,” he said. Gould said he enjoyed his time working in the family business. The restaurant was known for its spaghetti and meatballs, but when asked for the recipe for the sauce, Gould objected. Gould said back in its heyday, the restaurant featured famous bands of the time period. “I remember people talking about the bands that once played there. I also remember a lot of pretty well-known people coming in to ea, like racecar driver A.J. Foyt after a race at Mid-Ohio,” he said. Gould now lives in Bexley, but his uncle and several cousins still reside in Bucyrus. “All of us worked in the business at one point or another,” Gould said of family that includes his uncle Bob and aunt Michelle Chase. Gould’s mom Stephanie died in 2011. The farmhouse that was home to Posey’s restaurant for decades was purchased in December 2016 by MMB Development LLC, a group of Crawford County businessmen. “They already owned the lots surrounding the property where the restaurant was located,” said Gould. Gould said he would rather the building be torn down than to fall down. Still it makes him sad the farmhouse, built in the 1850s, is gone. But he said the memories he treasures will remain. Galion resident Dean Leuthold, who grew up in Bucyrus, said he is also sad to see the building torn down. 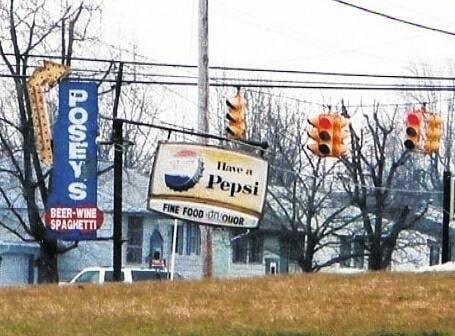 “Posey’s was locally famous for their spaghetti, and the steaks served up sizzling hot in front of you,” he said. “I took one of my first ‘real’ dates there, chaperoned by my parents, of course.